Writing & Healing: A Mindful Guide for Cancer Survivors uses a “prompt” to literally prompt the writing. 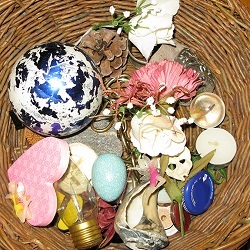 It could be an object from a basket, as seen in the picture above, with the suggestion to then write as if you were that object. “I am Helen, a heart, who has…..” or “ I am a bottle top and I live in…” etc. Providing a prompt takes away the fear of the blank page and quickly engages the imagination. There are many other “prompts” in the book: picture cards, cartoons, unfinished sentences, your own drawing, poetry, music, and more. And given 5-10 minutes to write, a story will emerge. And a story, with its beginning, middle, and end, relaxes you with its harmonious form. Like a mandala with words instead of lines. How is this healing? Through many years of using the writing prompts, I have seen that people can learn something they didn’t know about themselves through writing about a pine cone. The creative mind, not the logical, is used to write a story and allows the imagination to dip into what we did not know consciously. You might remember the kindness of a grandmother or the feeling of winter and something that went with that. As well, creativity relaxes the body and the mind. The writing can also be fun and funny. And, sometimes writing about a bottle top is simply writing about a bottle top. There is also something that happens in your brain. When you write, you are making a neural pathway. That doesn’t happen in the same way when you simply talk. You can’t go back and change the past, but through writing you can often change your understanding of it. You can rewire your brain, even with a story. The past can shift and turn when you write about it from the present. This is one of the great powers of writing. So try it. Pick an object from your “holds everything” drawer, or wherever you want. Spend some time looking at it. Maybe 3-5 minutes. Use your senses. How does it look? Feel? Smell? Don’t eat it, but if you could, what would it taste like? Finally, what might it sound like if it had a voice? Give it a voice. Spend about 5-10 minutes. You could begin “I am…..and I feel…..” Or “It was a day of bright sunshine and I”… Or, whatever way you want to begin. Give it a try.